Have you ever wanted to really get into the heart of Borneo? Did you get inspired by the book of Redmond O’Hanlon, ‘Into the heart of Borneo’ (if not, go read it!)? Or are you looking for something more challenging then the Mahakam? Then look no further, get up the Kayan river! 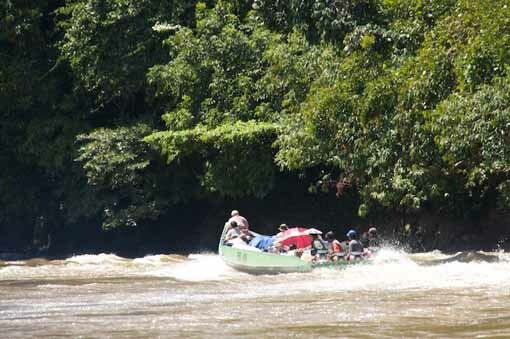 After a trip of two and a half day in a boat you will be in Kayan Mentarang National Park. That park can bring you beautiful pristine rainforest and almost self sufficient villages with extremely welcoming and friendly Dayak people. We started our trip by chartering a large (10 meter) boat in Tanjung Selor with 5 people. Tanjung Selor was a nice town to stay that obviously wasn’t used to lots of visitors. They had a nice nightmarket and a very nice juice stall (make use of it, you won’t be seeing those for days!). From there we moved upstream on the Kayan river. The scenery in the first part of the journey is that of a larger river that is used for transportation of coal, logs and other supplies. On the shores you see a lot of settlements and farmed land. For the first day of the trip we saw no primary forest. At the end of the first day we stopped in Long Bia. A small town with some shops and one hotel and one place to eat. The town seems to thrive on the income of the logging industry. It was the first time we saw that Christianity became bigger than the Islam. The next day we moved on with the same boat. The landscape and the river started changing. There was more primary forest and more small logging camps, Caterpillar has no scrupules and their yellow machines are everywhere. The river gor rougher and we started to see the first rapids. Before we new it we sometimes got splashed by water. In the end that didn’t matter because we got to endure tropical rain pouring down for three hours. Just before dark we arrived in Long Pujungan. This is basically the supply town for all the settlements in the park. Do not expect too much since there are only 6 shops and no mobile phone reception. There is only one hotel that has full board. This is also the place to organise further transport into the park. Very near to the school is a small WWF office. We found that the representative is never there so you have to ask around. This representative helped us show the options where we could go to. But he was most useful for arranging transport to Long Jelet and letting the village know, by radio, that we were going there. After a 3 hour boat ride with some small boats (maximum of two passengers) we arrived at the small village of Long Jelet. It consists of 16 houses, a school, a church and a communal hall. At the moment we were there, there were 24 inhabitants. The villagers said that a lot of them were working in Malaysia in the logging industry. We were welcomed by two guest families. They took us to their home and welcomed us with (very) sweet tea, cookies and sugar with rice. The village was amazing, it is totally self sufficient. The man in our house went fishing before breakfast. There are (dry!) rice fields, they grow garlic, water spinach and onions. They have chicken, catch fish and hunt for jungle pig in the forest. They cook on ovens that are built in their homes. And they only have power for 4 hours 3 times a week. Our house was build from wood and had a roof of leaves. We slept in the house on the floor, but had a mosquito net. Because I spoke Bahasa we learned a lot about the family. We were showed us some pictures and took us with them to their church on sunday. The entire cermon was dedicated to us and tree of us even got to speak in church. On our last night we got to join them in some ritual dancing. We got some funny heads and the girls got nice dresses. First the villagers showed us how it was done and then we were invited to have a go. This was probably quite funny to look at. After one last night sleeping on the floor we were shown off by the entire village. We even got baptised with some river water before leaving. Our host arranged two guides and we got even further up the river. On the way we had to get out for some rapids. There we learned the hard way that walking on flip-flops through the mud is a very bad idea. 750 meter took us three quarters of an hour and resulted in 2 destroyed flip-flops and a lot of bites by leeches. We stopped at a small hut. We installed ourselves with hammocks and left our luggage. Our guides led us on a track to a very nice waterfall of about 40 meters high. After the 2 hour walk we got to swim there, which was really refreshing because the jungle is steaming hot. Back at the hut we saw how good our guides were. They created fire within minutes, catched a very big fish and made us food and coffee. We took a swim and relaxed at the river. After we had eaten our rice, fish and water spinach we got to sleep in our hammocks. The night was pitch black. Then you realise how much light there is in our modern world. And every time you sleep in the jungle I am totally amazed by the sheer amount of noise. The cicades and all the other animals all try to outdo each other. The next day we left for the walk back to the village. Our GPS told us it was only a 5KM walk. It took us a total of 6 hours to complete those! We walked, slipped, fell and crawled along something that our guides called a track. The jungle was beautiful but soon we were so concentrated on not falling that we did no longer have too so much attention for this beauty. Along the way our guides took one of us by the hand for hours to help her along the track. They made walking sticks. Wooden knives to remove the leeches. And one of them even walked an hour ahead of us to boil some water out of a small stream. In the second half of the walk everything got easier and we could admire the very beautiful surroundings. There were some nice birds and amazing insects. I haven’t told you the most amazing part. Our guides were 70 years old! One of them was deaf and both of them could have walked circles around us in the jungle. Fly with MAF to the airstrip of Long Pujungan. MAF reportedly flies once a week to and from Long Pujungan. These flights are often full and priority is given to locals and church and government officials. There is also the option of chartering a plane. But due to the short runway (that actually has an L shape…) there can only be 3 westerners in a plane. Take a boat along the river. You can either charter a boat or join one of the boats that move up the river about twice a week. The chartered ones do it in two days with a stopover in Long Bia. The regular ones might take half a day more and you overnight where the Bahau branches of the Kayan river. From Long Pujungan you can go two ways, to Long Jelet (a three hour boat ride or 2.5 day walk) or Long Alango (6 hours). Long Jelet seems to be reachable almost always while Long Alango wasn’t reachable because of low water levels. You go on by smaller keting-tings, basically canoes propelled forward with an outboard motor. The water levels also influence how many times you have to push the boat or get out of the boat and walk because of rapids or low water levels. Tanjung Selor: There are three hotels opposite of the boat terminal. They are all Chinese. We staid at Hotel Asoy for 150.000 a room with air condition. Long Bia: There is only one hotel opposite the mosque. It cost 40.000 per person and the rooms are clean and nice to stay. Long Pujungan: Also only one option, hotel Kenari (owned by the same person as Hotel Asoy). We had a simple room (and 6 hours of power) including three meals a day for 150.000 per person. Long Jelet (and other villages): You will have to stay with people (which is really nice!). The WWF set up a program for that and it will cost you 80.000 a night including food. You will sleep on the wooden floor (just like the house owners) so bring your own mattress if you can’t stand that. Trekking: There are some huts in the jungle. We took a hammock that served us extremely well. Boat to Long Pujungan from Tanjung Selor: chartered 10 million (700 euro) or about 500.000 per person on regular boats. Hire of a guide is 80.000 a day and you need to hire 2 guides if you are with more then 2 persons. Some of the destinations around Long Jelet have fixed prices. Leuk om op jouw blog het verslag van onze jungletrip te lezen! We zijn nog aan het nagenieten, zowel van Kayan Mentarang National park, als van Derawan en omgeving!! Ik ben net terug van Curaçao en Bonaire, daar heb ik een aantal baaien gesampled met verschillende milieubelasting (recreatie, plastic, olieraffinaderij, riool). Het was heerlijk om weer even in de tropen veldwerk te doen! Op Curaçao heb ik ook een baai gevonden die sterk begraasd wordt door turtles, de graassporen waren heel mooi te zien, en ze hielden zich ook nog eens aan de regels 😉 (Thalassia testudinum mooi kort gegraasd tot 5 cm boven de grond). Veel succes nog met je resterende onderzoekstijd en ik ben benieuwd naar je nieuwe bevindingen! I love your blog and all the info you are supplying to the web! its a great resource. When you say “Without decent knowledge of Bahasa this trip is almost impossible”.. I want to know beacuse i can speak very basic bahasa. Would i be able to get by..? I want to visit this area and i am also travelling solo.. is it easy to find guides who can show me around and find accom and food? it sounds like such an adventure and certainly something i will enjoy. I also have lots of diving equipment and underwater camera so i will try to leave this all at Tanjung Selor as it’s unnecessary to carry.. So i would need to come back down the river the way i came..
Can you please get back to me via comment or email samytee at hotmail dot com.. any info you can provide me will be invaluable.. i’m planning on making this trip in the next few days..